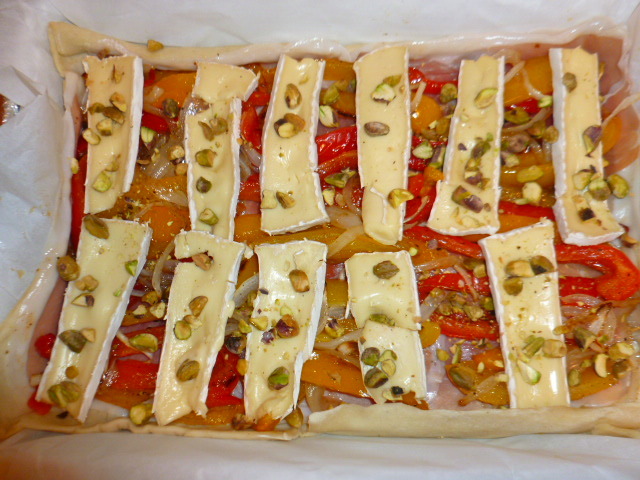 This easy to assemble tart has layers of flavors and colors: buttery and crispy puff pastry, topped with delicately salted prosciutto, roasted peppers and onions, creamy Brie cheese and crunchy pistachios. All these layers and textures add up to one tasty dish, which only requires a green salad to become a perfect and elegant lunch or dinner. 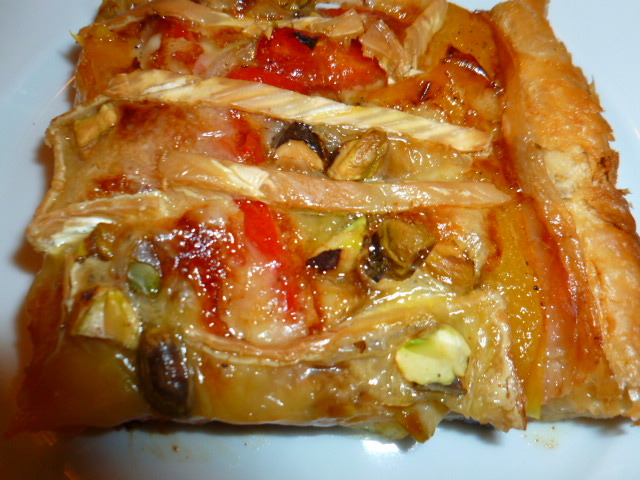 Cut into smaller squares, the tart can become an easy and tasty appetizer, or served as finger-food in a buffet dinner. 1. Preheat the oven to 420F (215C). 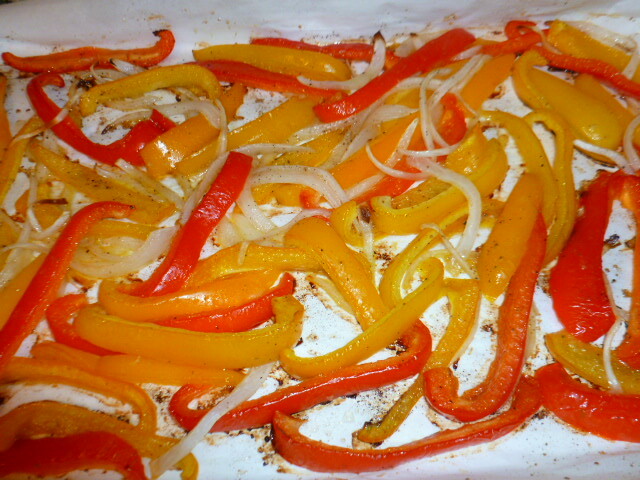 Line a sheet pan with baking paper. 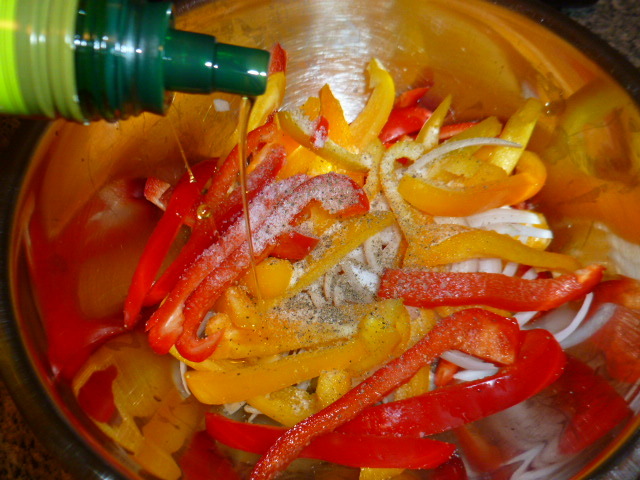 Mix the sliced onion and peppers in a bowl and season with salt, black pepper and olive oil. 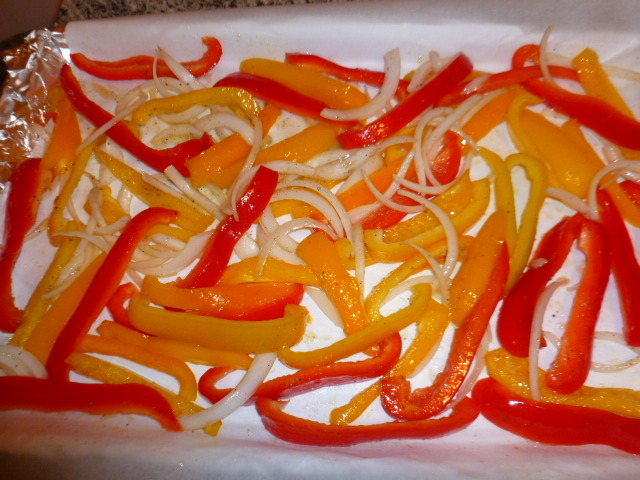 Place in one layer in the pan and roast for 15 minutes, until the peppers and onions are soft. Take out of the oven and let cool to room temperature. Keep the oven on. 2. 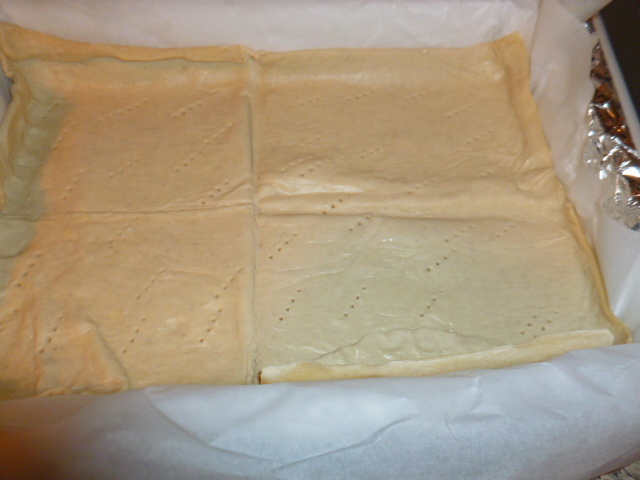 Line an 18”x11” (46cm x 28cm) baking pan with baking paper and place the rolled dough in it, pressing the edges of the dough to the sides of the pan, to create a rim. Prick the dough all over with a fork. 3. 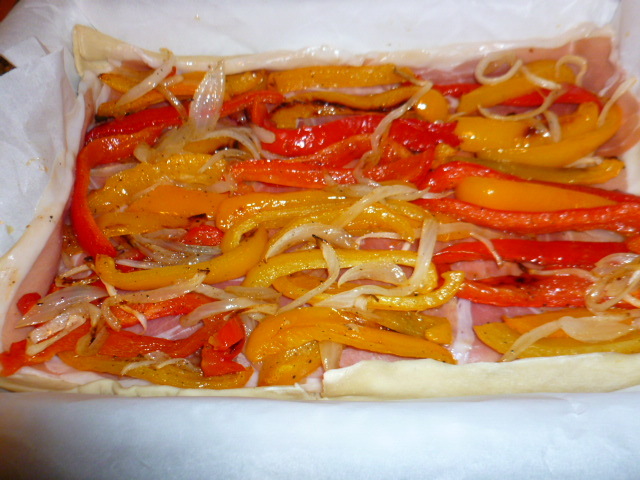 Layer the prosciutto on top and add the roasted onions and pepper over it. Finish with the Brie and pistachios. 4. Place the pan in the lower third part of the oven (so that the bottom will bake better). 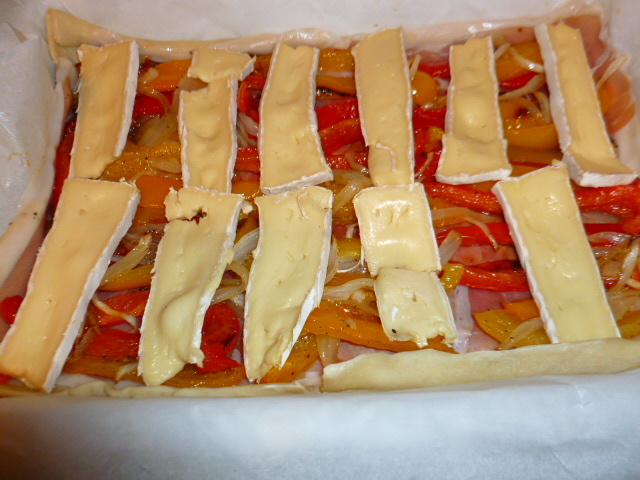 Bake for 35 minutes, or until the dough is golden-brown and the cheese is bubbly. Using the baking paper, slide the tart over to a cutting board. 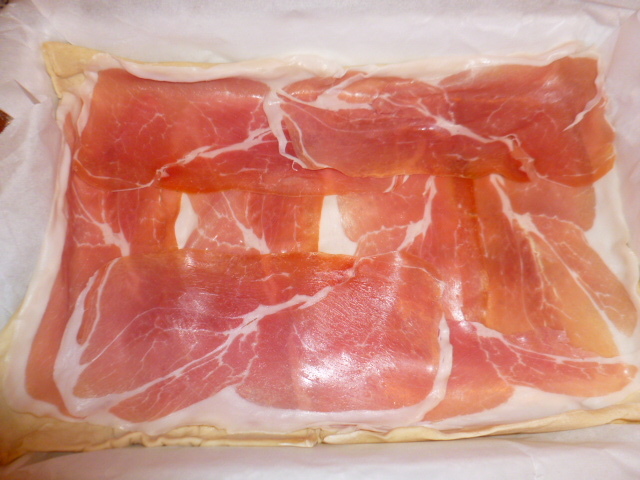 Cut into 6 portions with a large cutting knife and serve. Oh, my!!! That is DEFINITELY on my DO NEXT list!!! I still have about six ounces of Brie left, and am tired of nibbling it with Triscuits. Too salty!!! I have friends who LOVE my pizza, so this would be good to serve to them as French Pizza! This looks so fantastic, I swear my mouth is watering! :) Thanks for posting it and it’s on my to do list, too! This is so wonderful. I need to get out the puff pastry more often. It’s so perfect for lovely creations like this. Plus it fancies up a basic tart. Great ingredients. thanks! 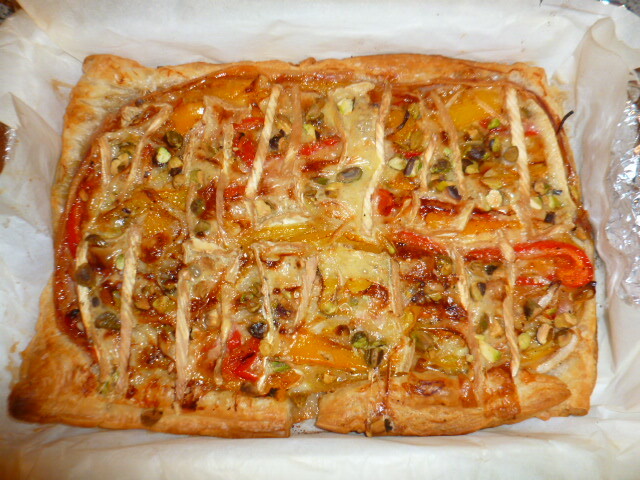 Good puff pastry at hand is indeed a great way to create quick and tasty tarts like this one and many others. Ooo :) this looks lovely :) Pistachios… that’s what my pantry is missing! 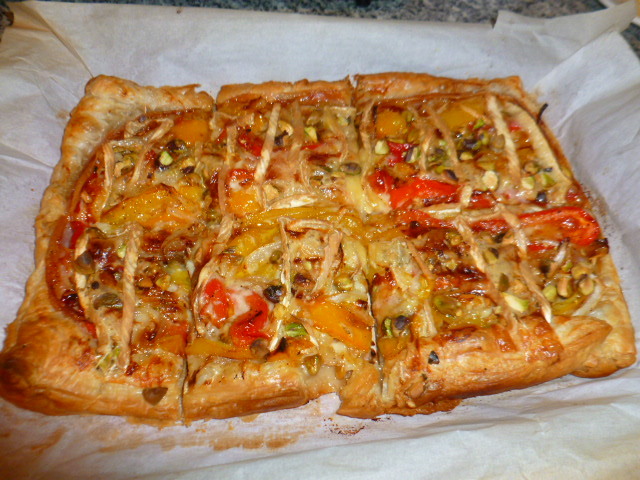 I think I need to experiment with a vegan pepper tart with pistachios and onion (a fantastic combination)! Your vegan option sounds good. I would suggest to add a layer of thinly sliced smoked tofu instead of the prosciutto, or a creamy tofu instead of the brie. I have to try this Ronit! This is a wow recipe. Thanks for sharing. This looks divine! I’ll have to serve this at my next Stitch Day with the ladies. They will love it. Your savory tart sounds terrific…perfect for a weekend lunch.